We are open at 6:30am to serve you breakfast. FREE breakfast entree (one per person present please) during breakfast hours today. Start your holiday weekend off right by coming in tonight for a FREE #1 combo meal. Cool off with a delicious 14-oz hand-spun milkshake today. Dine-in only please. One per person present. Buy one get one FREE every menu item! Free craft activity. Great balloon artist and/or face-painter and the Cow!! Come join the party. The WHOLE family eats FREE tonight from 5-8pm. Work together to create your cow costume pieces for Cow Appreciation Day July 8, when if you dress like a cow, you get FREE chicken. Stop by for a FREE chicken biscuit today (one per person present please). WARNING: the Chick-n-Minis are addicting and it is impossible to eat just one. So we are giving you a 3-ct for FREE today. One box per person present please. Full cow costume = FREE meal. Partial cow costume = FREE entree. 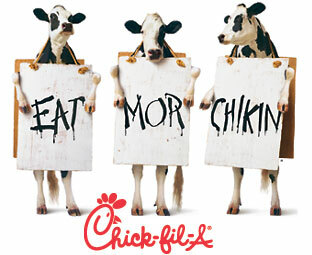 Submit photo of yourself/family in cow outfit to @cfaelcontucson on twitter to enter our photo contest. No purchase necessary. FREE small ice dream cone. Dine-in only please. One per person present please. Cool off with ice dream on a hot summer Tucson day. Thank-you for serving your country. Active-duty military with ID receive a different FREE item every Monday in July. One per person present please. Try our breakfast spicy or original chicken biscuit for FREE all day today. One per person present please. Free 4-nugget Kids Meal with adult meal purchase and child present. Free craft activity. Great balloon artist and/or face-painter and the Cow!! Come join the party.